New features include ACH (Payment Processing), In-product Messenger (IPM) improvements, and the Sage Intelligence Reporting feature will be activated automatically! 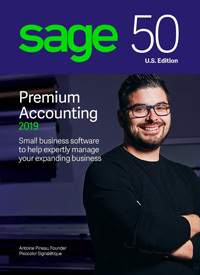 The Sage 50 suite of accounting programs for business is available in three software versions geared toward your specific needs: Sage 50 Pro, Sage 50 Premium, and Sage 50 Quantum Accounting, as well as a Sage 50 Subscription Service for Sage Business Care support. Don't know which version you need? Compare different versions of Sage 50 2019 software here. 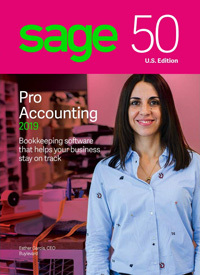 *Sage 50 Accounting Product Users who use Peachtree Complete Accounting or Sage 50 Complete Accounting will need to upgrade to Sage 50 Premium Accounting. 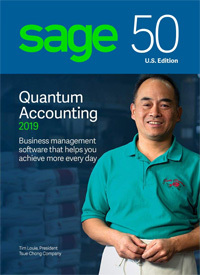 Sage's vertical solutions (industry specific - Manufacturing, Distribution, Construction, and Nonprofit) are now included in Sage 50 Quantum Accounting 2019.